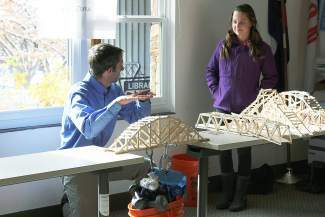 The Vail Valley Homeschool Group had an awesome Popsicle Stick Bridge Contest! Thank you to all of the kids who participated, all of the parents for your help and to the Avon library for allowing us to use your space! Winners in each category were Brian Molloy,7, Will Neumann, 9, Jacob Lindall, 10, and Samantha Lindall, 13. Some of the bridges held as much as 116 and 230 pounds! Great job, everyone! We can't wait to see the designs you come up with for next year!